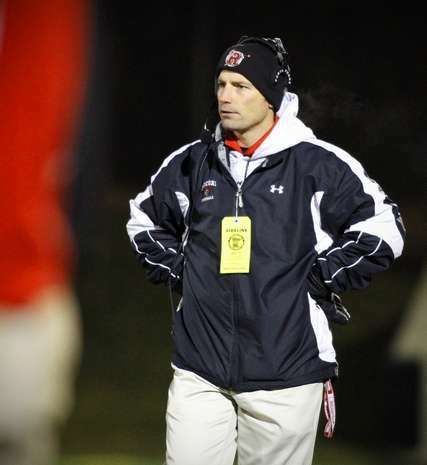 For the past seven years Mike Rowe has been an active member of the ROCORI School District, working as a third grade teacher and head coach of the Spartans Football program. Under Coach Rowe ROCORI high school has won two conference titles, four section championships, and appeared in the state playoff in 2011, 2014, 2015, 2016, and 2017. In 2011 the Spartans won their first ever State Football Championship. Coach Rowe has been an advocate for developing character in his athletes and in 2014 the NFL featured him in a video that aimed to stop domestic violence and dating violence. Prior to taking over the Spartans Football program Mike Rowe was coaching college football at Central Lakes College, Minot State, and St. Cloud State. Mike has been involved in the NFL High School Player Development Camps the last three years, and is married to wife Elisabeth, with whom he has three children Avery, Ainsley, and Grayson. Coach Rowe has also partnered with Coaches-Clinic.com to make both his Team Building the Spartan Way Program , as well as his Spartan Spread System available to other coaches. Why Run the Spread Offense?